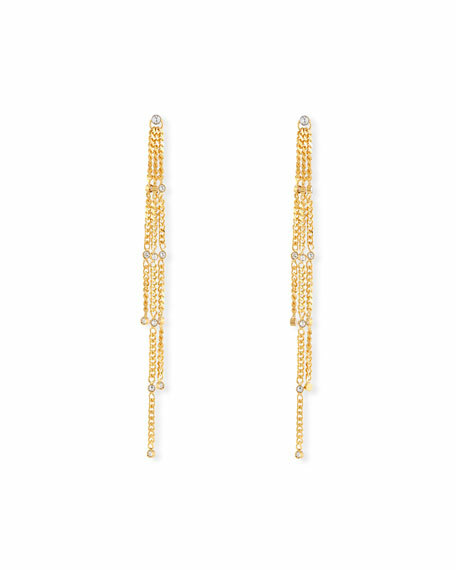 Stella solitaire drop earrings by Vita Fede. 24-karat yellow gold plated hardware. Single round Swarovski crystal post. Three chain dangles with crystals. Founded in 2009 by designer Cynthia K. Sakai, Vita Fede is a collection of handcrafted jewelry and accessories made in Italy. Inspiration from art, architecture and culture create the VF aesthetic: timeless luxury with a feminine twist. Vita Fede translates to 'Life' and 'Faith,' two things that connect people everywhere, and, like VF designs, continue to evolve without losing the essential elements that define them. For in-store inquiries, use sku #2433781.